Well today I thought I would do a special Christmas Giveaway to all of my readers, this year has been quite a big one for me on the blogging front and I wouldn't have been able to do any of it without all of you. So, whilst on a recent shopping trip with my mum, I came across this amazing Kate Spade purse and thought it would be a great giveaway. I have one myself and absolutely love it, though I only use it for special occasions and I hope you like it too. 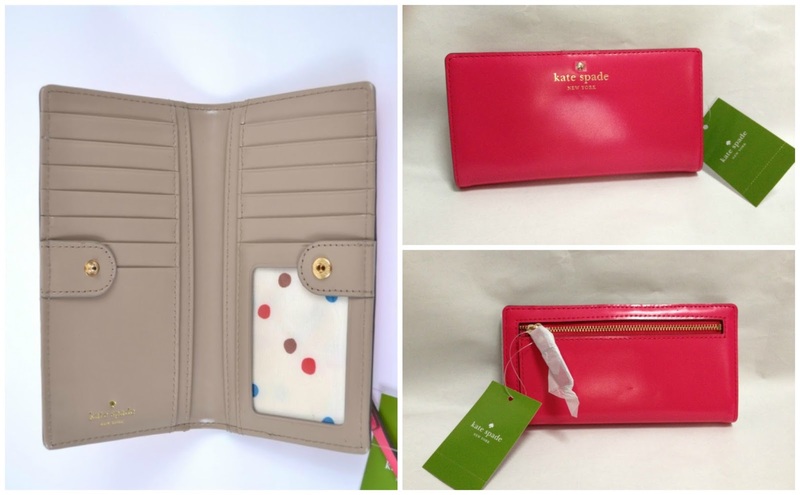 This is a medium sized Kate Spade purse in Ringwald Pink and it features a button snap to close and inside you will find multiple card holders and a photograph/ID section. On the back of the purse is a zip pocket for your change and of course space for notage inside. All you have to do to win is complete the entry form below. Some of the options are Mandatory and must be completed, if they are not done so (and I check everyone) your entries will be removed from the competition. I would love to win this for my mum as her present purse is worn with age! Have you seen the Kate Spade stuff for Gap? They have some lovely kids clothes and shoes that I want for my niece. I would keep it for myself, it's too pretty and would be my first Kate Spade item! I would defiantly give this to my best friend, as I think she deserve a gorgeous present like this! It'd be a present for me!! Hope this doesn't sound selfish but myself with having a child there is no way for a long time would be able to own a kate spade purse so this would be amazing. I'd give it my daughter, a poor fashion student who would love it. Definitely one for keeping. Love the festive colour but perfect for all year round! Aw what a gorgeous purse! I'd probably keep it to myself haha. I'd keep it for myself, Mine is falling apart! I would keep it for myself, Kate Spade purses are amazing! I would give this to my mum for her birthday next month! This would definitely be a lovely thank you gift for my Mam. To say she deserves it, would be an understatement! I'd give it to my mum. Thanks for the lovely giveaway. My lovely mummy would adore this! I would have to keep it myself! After getting my Kate Spade Red bag, I saw how much my Mum loved Kate Spade, so I'd give the purse to her! If I won I would give it to myself as a new mum I currently use a separate card wallet to a coin purse so having everything in one place would be super handy. I think I'd keep it for myself - it's gorgeous! If I won, I would either keep the wallet, or give it to my sister.... I haven't decided yet, haha. If I won I would give the purse to my mum because I know how much she adores Kate Spade and she would definitely love this. It will cheer her up whilst she is recovering from her recent operation. I am using my friend's computer and it won't let me comment as myself because she' already logged in, I can't seem to be able to change it to my name.